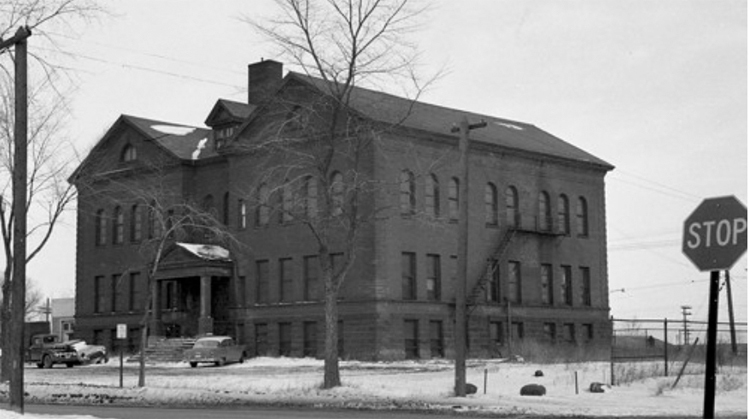 Duluth’s first Monroe School, built in 1884, stood at the southeast corner of Twenty-Fifth Avenue West and West First Street. Run by Annie Hicken, the wooden structure (all four rooms of it) stood “farthest west of all the schools.” In 1900 the tiny building was replaced, but not destroyed; it was moved to Eleventh Avenue West and Piedmont Avenue and renamed the Horace Mann School. The 1900 Monroe School, two stories of brick trimmed in brownstone, contained eight classrooms. It opened in January 1900 and served the West End until 1951. While most Monroe students attended the new building, others were sent to Bryant Elementary. When Monroe closed, local students attended Lincoln Elementary. After closing as an educational institution, the building was used as a storage facility by several Duluth firms, including Central Sales and Garon Knitting Mill. A suspicious fire in 1992 ravaged the building, which had been vandalized the day before the blaze. Monroe had to be razed for safety reasons; the site is now a parking lot.